Palestine (Arabic: فلسطين‎ Filasṭīn, Falasṭīn, Filisṭīn; Greek: Παλαιστίνη, Palaistinē; Latin: Palaestina; Hebrew: פלשתינה‎ Palestina) is a geographic region in Western Asia usually considered to include Israel, the West Bank, the Gaza Strip, and in some definitions, some parts of western Jordan. The name was used by ancient Greek writers, and it was later used for the Roman province Syria Palaestina, the Byzantine Palaestina Prima, and the Islamic provincial district of Jund Filastin. 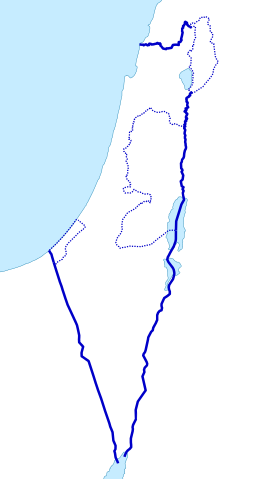 The region comprises most of the territory claimed for the biblical regions known as the Land of Israel (Hebrew: ארץ־ישראל‎ Eretz-Yisra'el), the Holy Land or Promised Land. Historically, it has been known as the southern portion of wider regional designations such as Canaan, Syria, ash-Sham, and the Levant. Situated at a strategic location between Egypt, Syria and Arabia, and the birthplace of Judaism and Christianity, the region has a long and tumultuous history as a crossroads for religion, culture, commerce, and politics. The region has been controlled by numerous peoples, including Ancient Egyptians, Canaanites, Israelites and Judeans, Assyrians, Babylonians, Achaemenids, ancient Greeks, the Jewish Hasmonean Kingdom, Romans, Parthians, Sasanians, Byzantines, the Arab Rashidun, Umayyad, Abbasid and Fatimid caliphates, Crusaders, Ayyubids, Mamluks, Mongols, Ottomans, the British, and modern Israelis, Jordanians, Egyptians and Palestinians. Further information: Timeline of the name "Palestine"
The first clear use of the term Palestine to refer to the entire area between Phoenicia and Egypt was in 5th century BCE Ancient Greece, when Herodotus wrote of a "district of Syria, called Palaistinê" (Ancient Greek: Συρίη ἡ Παλαιστίνη καλεομένη) in The Histories, which included the Judean mountains and the Jordan Rift Valley. [ii] Approximately a century later, Aristotle used a similar definition for the region in Meteorology, in which he included the Dead Sea. Later Greek writers such as Polemon and Pausanias also used the term to refer to the same region, which was followed by Roman writers such as Ovid, Tibullus, Pomponius Mela, Pliny the Elder, Dio Chrysostom, Statius, Plutarch as well as Roman Judean writers Philo of Alexandria and Josephus. The term was first used to denote an official province in c. 135 CE, when the Roman authorities, following the suppression of the Bar Kokhba Revolt, combined Iudaea Province with Galilee and the Paralia to form "Syria Palaestina". There is circumstantial evidence linking Hadrian with the name change, but the precise date is not certain and the assertion of some scholars that the name change was intended "to complete the dissociation with Judaea" is disputed. The term is generally accepted to be a translation of the Biblical name Peleshet (פלשת Pəlésheth, usually transliterated as Philistia). The term and its derivates are used more than 250 times in Masoretic-derived versions of the Hebrew Bible, of which 10 uses are in the Torah, with undefined boundaries, and almost 200 of the remaining references are in the Book of Judges and the Books of Samuel. The term is rarely used in the Septuagint, which used a transliteration Land of Phylistieim (Γῆ τῶν Φυλιστιείμ) different from the contemporary Greek place name Palaistínē (Παλαιστίνη). The Septuagint instead used the term "allophuloi" (άλλόφυλοι, "other nations") throughout the Books of Judges and Samuel, such that the term "Philistines" has been interpreted to mean "non-Israelites of the Promised Land" when used in the context of Samson, Saul and David, and Rabbinic sources explain that these peoples were different from the Philistines of the Book of Genesis. During the Byzantine period, the region of Palestine within Syria Palaestina was subdivided into Palaestina Prima and Secunda, and an area of land including the Negev and Sinai became Palaestina Salutaris. Following the Muslim conquest, place names that were in use by the Byzantine administration generally continued to be used in Arabic. The use of the name "Palestine" became common in Early Modern English, was used in English and Arabic during the Mutasarrifate of Jerusalem[iii] and was revived as an official place name with the British Mandate for Palestine. Some other terms that have been used to refer to all or part of this land include Canaan, Land of Israel (Eretz Yisrael or Ha'aretz),[iv] the Promised Land, Greater Syria, the Holy Land, Iudaea Province, Judea, Coele-Syria,[v] "Israel HaShlema", Kingdom of Israel, Kingdom of Jerusalem, Zion, Retenu (Ancient Egyptian), Southern Syria, Southern Levant and Syria Palaestina. For a more comprehensive list, see Time periods in the Palestine region. Situated at a strategic location between Egypt, Syria and Arabia, and the birthplace of Judaism and Christianity, the region has a long and tumultuous history as a crossroads for religion, culture, commerce, and politics. The region has been controlled by numerous peoples, including Ancient Egyptians, Canaanites, Israelites, Assyrians, Babylonians, Achaemenids, Ancient Greeks, Romans, Parthians, Sasanians, Byzantines, the Arab Rashidun, Umayyad, Abbasid and Fatimid caliphates, Crusaders, Ayyubids, Mamluks, Mongols, Ottomans, the British, and modern Israelis and Palestinians. Modern archaeologists and historians of the region refer to their field of study as Levantine archaeology. The region was among the earliest in the world to see human habitation, agricultural communities and civilization. During the Bronze Age, independent Canaanite city-states were established, and were influenced by the surrounding civilizations of ancient Egypt, Mesopotamia, Phoenicia, Minoan Crete, and Syria. Between 1550 and 1400 BCE, the Canaanite cities became vassals to the Egyptian New Kingdom who held power until the 1178 BCE Battle of Djahy (Canaan) during the wider Bronze Age collapse. The Israelites emerged from a dramatic social transformation that took place in the people of the central hill country of Canaan around 1200 BCE, with no signs of violent invasion or even of peaceful infiltration of a clearly defined ethnic group from elsewhere. During the Iron Age the Israelites established two related kingdoms, Israel and Judah. The Kingdom of Israel emerged as an important local power by the 10th century BCE before falling to the Neo-Assyrian Empire in 722 BCE. Israel's southern neighbor, the Kingdom of Judah, emerged in the 8th or 9th century BCE and later became a client state of first the Neo-Assyrian and then the Neo-Babylonian Empire before a revolt against the latter led to its destruction in 586 BCE. The region became part of the Neo-Assyrian Empire from c. 740 BCE, which was itself replaced by the Neo-Babylonian Empire in c. 627 BCE. According to the Bible, a war with Egypt culminated in 586 BCE when Jerusalem was destroyed by the Babylonian king Nebuchadnezzar II and the king and upper class of the Kingdom of Judah were deported to Babylon. In 539 BCE, the Babylonian empire was replaced by the Achaemenid Empire. According to the Bible and implications from the Cyrus Cylinder, the exiled population of Judah was allowed to return to Jerusalem. Southern Palestine became a province of the Achaemenid Empire, called Idumea, and the evidence from ostraca suggests that a Nabataean-type society, since the Idumeans appear to be connected to the Nabataeans, took shape in southern Palestine in the 4th century B.C.E., and that the Qedarite Arab kingdom penetrated throughout this area through the period of Persian and Hellenistic dominion. In the 330s BCE, Macedonian ruler Alexander the Great conquered the region, which changed hands several times during the wars of the Diadochi and later Syrian Wars. It ultimately fell to the Seleucid Empire between 219–200 BCE. In 116 BCE, a Seleucid civil war resulted in the independence of certain regions including the Hasmonean principality in the Judaean Mountains. From 110 BCE, the Hasmoneans extended their authority over much of Palestine, creating a Judaean–Samaritan–Idumaean–Ituraean–Galilean alliance. The Judaean (Jewish, see Ioudaioi) control over the wider region resulted in it also becoming known as Judaea, a term that had previously only referred to the smaller region of the Judaean Mountains. Between 73–63 BCE, the Roman Republic extended its influence into the region in the Third Mithridatic War, conquering Judea in 63 BCE, and splitting the former Hasmonean Kingdom into five districts. In around 40 BCE, the Parthians conquered Palestine, deposed the Roman ally Hyrcanus II, and installed a puppet ruler of the Hasmonean line known as Antigonus II. By 37 BCE, the Parthians withdrew from Palestine. The three-year Ministry of Jesus, culminating in his crucifixion, is estimated to have occurred from 28–30 CE, although the historicity of Jesus is disputed by a minority of scholars. [vi] In 70 CE, Titus sacked Jerusalem, resulting in the dispersal of the city's Jews and Christians to Yavne and Pella. In 132 CE, Hadrian joined the province of Iudaea with Galilee and the Paralia to form new province of Syria Palaestina, and Jerusalem was renamed "Aelia Capitolina". Between 259–272, the region fell under the rule of Odaenathus as King of the Palmyrene Empire. Following the victory of Christian emperor Constantine in the Civil wars of the Tetrarchy, the Christianization of the Roman Empire began, and in 326, Constantine's mother Saint Helena visited Jerusalem and began the construction of churches and shrines. Palestine became a center of Christianity, attracting numerous monks and religious scholars. The Samaritan Revolts during this period caused their near extinction. In 614 CE, Palestine was annexed by another Persian dynasty; the Sassanids, until returning to Byzantine control in 628 CE. Palestine was conquered by the Islamic Caliphate, beginning in 634 CE. In 636, the Battle of Yarmouk during the Muslim conquest of the Levant marked the start of Muslim hegemony over the region, which became known as Jund Filastin within the province of Bilâd al-Shâm (Greater Syria). In 661, with the Assassination of Ali, Muawiyah I became the Caliph of the Islamic world after being crowned in Jerusalem. The Dome of the Rock, completed in 691, was the world's first great work of Islamic architecture. The majority of the population was Christian and was to remain so until the conquest of Saladin in 1187. The Muslim conquest apparently had little impact on social and administrative continuities for several decades. [vii] The word 'Arab' at the time referred predominantly to Bedouin nomads, though Arab settlement is attested in the Judean highlands and near Jerusalem by the 5th century, and some tribes had converted to Christianity. The local population engaged in farming, which was considered demeaning, and were called Nabaț, referring to Aramaic-speaking villagers. A ḥadīth, brought in the name of a Muslim freedman who settled in Palestine, ordered the Muslim Arabs not to settle in the villages, "for he who abides in villages it is as if he abides in graves". The Crusader fortress in Acre, also known as the Hospitaller Fortress, was built during the 12th century. The Umayyads, who had spurred a strong economic resurgence in the area, were replaced by the Abbasids in 750. Ramla became the administrative centre for the following centuries, while Tiberias became a thriving centre of Muslim scholarship. From 878, Palestine was ruled from Egypt by semi-autonomous rulers for almost a century, beginning with the Turkish freeman Ahmad ibn Tulun, for whom both Jews and Christians prayed when he lay dying and ending with the Ikhshidid rulers. Reverence for Jerusalem increased during this period, with many of the Egyptian rulers choosing to be buried there. However, the later period became characterized by persecution of Christians as the threat from Byzantium grew. The Fatimids, with a predominantly Berber army, conquered the region in 970, a date that marks the beginning of a period of unceasing warfare between numerous enemies, which destroyed Palestine, and in particular devastating its Jewish population. Between 1071 and 1073, Palestine was captured by the Great Seljuq Empire, only to be recaptured by the Fatimids in 1098, who then lost the region to the Crusaders in 1099. The latter set up the Kingdom of Jerusalem (1099–1291). Their control of Jerusalem and most of Palestine lasted almost a century until their defeat by Saladin's forces in 1187, after which most of Palestine was controlled by the Ayyubids, except for the years 1229–1244 when Jerusalem and other areas were retaken by the Acre-based Kingdom of Jerusalem (1191-1291), but, despite seven further crusades, the Crusaders were no longer a significant power in the region. The Fourth Crusade, which did not reach Palestine, led directly to the decline of the Byzantine Empire, dramatically reducing Christian influence throughout the region. The Mamluk Sultanate was indirectly created in Egypt as a result of the Seventh Crusade. The Mongol Empire reached Palestine for the first time in 1260, beginning with the Mongol raids into Palestine under Nestorian Christian general Kitbuqa, and reaching an apex at the pivotal Battle of Ain Jalut, where they were routed by the Mamluks. In 1486, hostilities broke out between the Mamluks and the Ottoman Empire in a battle for control over western Asia, and the Ottomans conquered Palestine in 1516. Between the mid-16th and 17th centuries, a close-knit alliance of three local dynasties, the Ridwans of Gaza, the Turabays of al-Lajjun and the Farrukhs of Nablus, governed Palestine on behalf of the Porte (imperial Ottoman government). The Khan al-Umdan, constructed in Acre in 1784, is the largest and best preserved caravanserai in the region. In the 18th century, the Zaydani clan under the leadership of Zahir al-Umar ruled large parts of Palestine autonomously until the Ottomans were able to defeat them in their Galilee strongholds in 1775–76. Zahir had turned the port city of Acre into a major regional power, partly fueled by his monopolization of the cotton and olive oil trade from Palestine to Europe. Acre's regional dominance was further elevated under Zahir's successor Ahmad Pasha al-Jazzar at the expense of Damascus. In 1830, on the eve of Muhammad Ali's invasion, the Porte transferred control of the sanjaks of Jerusalem and Nablus to Abdullah Pasha, the governor of Acre. According to Silverburg, in regional and cultural terms this move was important for creating an Arab Palestine detached from greater Syria (bilad al-Sham). According to Pappe, it was an attempt to reinforce the Syrian front in face of Muhammad Ali's invasion. Two years later, Palestine was conquered by Muhammad Ali's Egypt, but Egyptian rule was challenged in 1834 by a countrywide popular uprising against conscription and other measures considered intrusive by the population. Its suppression devastated many of Palestine's villages and major towns. In 1840, Britain intervened and returned control of the Levant to the Ottomans in return for further capitulations. The death of Aqil Agha marked the last local challenge to Ottoman centralization in Palestine, and beginning in the 1860s, Palestine underwent an acceleration in its socio-economic development, due to its incorporation into the global, and particularly European, economic pattern of growth. The beneficiaries of this process were Arabic-speaking Muslims and Christians who emerged as a new layer within the Arab elite. From 1880 large-scale Jewish immigration began, almost entirely from Europe, based on an explicitly Zionist ideology. There was also a revival of the Hebrew language and culture. Christian Zionism in the United Kingdom preceded its spread within the Jewish community. The government of Great Britain publicly supported it during World War I with the Balfour Declaration of 1917. Palestine passport and Palestine coin. The Mandatory authorities agreed a compromise position regarding the Hebrew name: in English and Arabic the name was simply "Palestine" ( "فلسطين"), but the Hebrew version "(פלשתינה)" also included the acronym "(א״י)" for Eretz Yisrael (Land of Israel). The new era in Palestine. 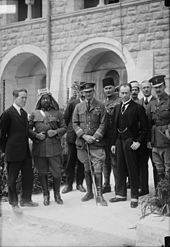 The arrival of Herbert Samuel as the first High Commissioner for Palestine in 1920. Samuel had promoted Zionism within the British Cabinet, beginning with his 1915 memorandum entitled The Future of Palestine. Beside him are Lawrence of Arabia, Emir Abdullah, Air Marshal Salmond and Wyndham Deedes. The British were formally awarded the mandate to govern the region in 1922. The non-Jewish Palestinians revolted in 1920, 1929, and 1936. In 1947, following World War II and The Holocaust, the British Government announced its desire to terminate the Mandate, and the United Nations General Assembly adopted in November 1947 a Resolution 181(II) recommending partition into an Arab state, a Jewish state and the Special International Regime for the City of Jerusalem. The Jewish leadership accepted the proposal, but the Arab Higher Committee rejected it; a civil war began immediately after the Resolution's adoption. The State of Israel was declared in May 1948. In the 1948 Arab–Israeli War, Israel captured and incorporated a further 26% of the Mandate territory, Jordan captured the region of Judea and Samaria, renaming it the "West Bank", while the Gaza Strip was captured by Egypt. Following the 1948 Palestinian exodus, also known as al-Nakba, the 700,000 Palestinians who fled or were driven from their homes were not allowed to return following the Lausanne Conference of 1949. In the course of the Six-Day War in June 1967, Israel captured the rest of Mandate Palestine from Jordan and Egypt, and began a policy of establishing Jewish settlements in those territories. From 1987 to 1993, the First Palestinian Intifada against Israel took place, which included the Declaration of the State of Palestine in 1988 and ended with the 1993 Oslo Peace Accords and the creation of the Palestinian National Authority. Satellite image of the region of Palestine, 2003. The boundaries of Palestine have varied throughout history. [xi][xii] The Jordan Rift Valley (comprising Wadi Arabah, the Dead Sea and River Jordan) has at times formed a political and administrative frontier, even within empires that have controlled both territories. 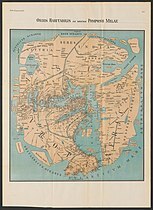 At other times, such as during certain periods during the Hasmonean and Crusader states for example, as well as during the biblical period, territories on both sides of the river formed part of the same administrative unit. During the Arab Caliphate period, parts of southern Lebanon and the northern highland areas of Palestine and Jordan were administered as Jund al-Urdun, while the southern parts of the latter two formed part of Jund Dimashq, which during the 9th century was attached to the administrative unit of Jund Filastin. Nineteenth-century sources refer to Palestine as extending from the sea to the caravan route, presumably the Hejaz-Damascus route east of the Jordan River valley. Others refer to it as extending from the sea to the desert. Prior to the Allied Powers victory in World War I and the partitioning of the Ottoman Empire, which created the British mandate in the Levant, most of the northern area of what is today Jordan formed part of the Ottoman Vilayet of Damascus (Syria), while the southern part of Jordan was part of the Vilayet of Hejaz. What later became Mandatory Palestine was in late Ottoman times divided between the Vilayet of Beirut (Lebanon) and the Sanjak of Jerusalem. The Zionist Organization provided its definition of the boundaries of Palestine in a statement to the Paris Peace Conference in 1919. The British administered Mandatory Palestine after World War I, having promised to establish a homeland for the Jewish people. 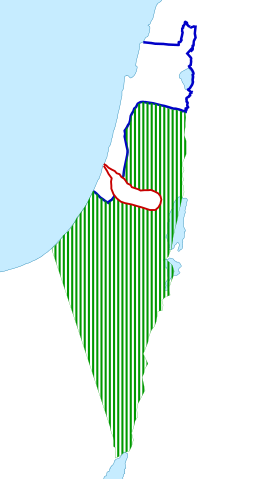 The modern definition of the region follows the boundaries of that entity, which were fixed in the North and East in 1920–23 by the British Mandate for Palestine (including the Transjordan memorandum) and the Paulet–Newcombe Agreement, and on the South by following the 1906 Turco-Egyptian boundary agreement. 1916–1922 proposals: Three proposals for the post World War I administration of Palestine. The red line is the "International Administration" proposed in the 1916 Sykes–Picot Agreement, the dashed blue line is the 1919 Zionist Organization proposal at the Paris Peace Conference, and the thin blue line refers to the final borders of the 1923–48 Mandatory Palestine. 1937 proposal: The first official proposal for partition, published in 1937 by the Peel Commission. An ongoing British Mandate was proposed to keep "the sanctity of Jerusalem and Bethlehem", in the form of an enclave from Jerusalem to Jaffa, including Lydda and Ramle. 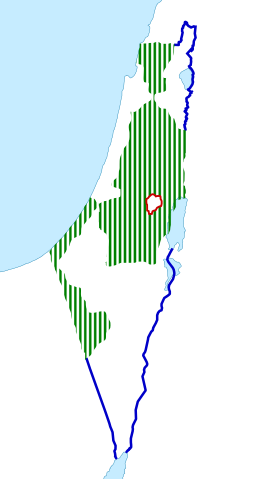 1947 (proposal): Proposal per the United Nations Partition Plan for Palestine (UN General Assembly Resolution 181 (II), 1947), prior to the 1948 Arab–Israeli War. The proposal included a Corpus Separatum for Jerusalem, extraterritorial crossroads between the non-contiguous areas, and Jaffa as an Arab exclave. 1947 (actual): Mandatory Palestine, showing Jewish-owned regions in Palestine as of 1947 in blue, constituting 6% of the total land area, of which more than half was held by the JNF and PICA. The Jewish population had increased from 83,790 in 1922 to 608,000 in 1946. 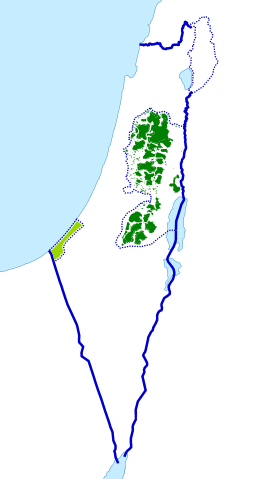 1948–1967 (actual): The Jordanian-annexed West Bank (light green) and Egyptian-occupied Gaza Strip (dark green), after the 1948 Arab–Israeli War, showing 1949 armistice lines. 1967–1994: During the Six-Day War, Israel captured the West Bank, the Gaza Strip, and the Golan Heights, together with the Sinai Peninsula (later traded for peace after the Yom Kippur War). In 1980–81 Israel annexed East Jerusalem and the Golan Heights. Neither Israel's annexation nor Palestine's claim over East Jerusalem has been internationally recognized. 1994–2006: Under the Oslo Accords, the Palestinian National Authority was created to provide civil government in certain urban areas of the West Bank and the Gaza Strip. 2006–present: After the Israeli disengagement from Gaza and clashes between the two main Palestinian parties following the Hamas electoral victory, two separate executive governments took control in Gaza and the West Bank. The region of Palestine is the eponym for the Palestinian people and the culture of Palestine, both of which are defined as relating to the whole historical region, usually defined as the localities within the border of Mandatory Palestine. The 1968 Palestinian National Covenant described Palestine as the "homeland of the Arab Palestinian people", with "the boundaries it had during the British Mandate". However, since the 1988 Palestinian Declaration of Independence, the term State of Palestine refers only to the West Bank and the Gaza Strip. This discrepancy was described by the Palestinian president Mahmoud Abbas as a negotiated concession in a September 2011 speech to the United Nations: "... we agreed to establish the State of Palestine on only 22% of the territory of historical Palestine – on all the Palestinian Territory occupied by Israel in 1967." Historical population table compiled by Sergio DellaPergola. Figures in thousands. The Bar Kokhba revolt in the 2nd century CE saw a major shift in the population of Palestine. The sheer scale and scope of the overall destruction has been described by Dio Cassius in his Roman History, where he notes that Roman war operations in the country had left some 580,000 Jews dead, with many more dying of hunger and disease, while 50 of their most important outposts and 985 of their most famous villages were razed to the ground. "Thus," writes Dio Cassius, "nearly the whole of Judaea was made desolate." According to Israeli archaeologists Magen Broshi and Yigal Shiloh, the population of ancient Palestine did not exceed one million. By 300 CE, Christianity had spread so significantly that Jews comprised only a quarter of the population. [T]he first half century of Ottoman rule brought a sharp increase in population. The towns grew rapidly, villages became larger and more numerous, and there was an extensive development of agriculture, industry, and trade. The two last were certamly helped to no small extent by the influx of Spanish and other Western Jews. According to Alexander Scholch, the population of Palestine in 1850 was about 350,000 inhabitants, 30% of whom lived in 13 towns; roughly 85% were Muslims, 11% were Christians and 4% Jews. Of these, 235,000 live in the larger towns, 465,000 in the smaller towns and villages. Four-fifths of the whole population are Moslems. A small proportion of these are Bedouin Arabs; the remainder, although they speak Arabic and are termed Arabs, are largely of mixed race. Some 77,000 of the population are Christians, in large majority belonging to the Orthodox Church, and speaking Arabic. The minority are members of the Latin or of the Uniate Greek Catholic Church, or—a small number—are Protestants. The Jewish element of the population numbers 76,000. Almost all have entered Palestine during the last 40 years. Prior to 1850, there were in the country only a handful of Jews. In the following 30 years, a few hundreds came to Palestine. Most of them were animated by religious motives; they came to pray and to die in the Holy Land, and to be buried in its soil. After the persecutions in Russia forty years ago, the movement of the Jews to Palestine assumed larger proportions. According to the Israel Central Bureau of Statistics, as of 2015[update], the total population of Israel was 8.5 million people, of which 75% were Jews, 21% Arabs, and 4% "others." Of the Jewish group, 76% were Sabras (born in Israel); the rest were olim (immigrants)—16% from Europe, the former Soviet republics, and the Americas, and 8% from Asia and Africa, including the Arab countries. According to the Palestinian Central Bureau of Statistics evaluations, in 2015 the Palestinian population of the West Bank was approximately 2.9 million and that of the Gaza Strip was 1.8 million. Gaza's population is expected to increase to 2.1 million people in 2020, leading to a density of more than 5,800 people per square kilometre. Both Israeli and Palestinian statistics include Arab residents of East Jerusalem in their reports. According to these estimates the total population in the region of Palestine, as defined as Israel and the Palestinian territories, stands approximately 12.8 million. The World Geographical Scheme for Recording Plant Distributions is widely used in recording the distribution of plants. 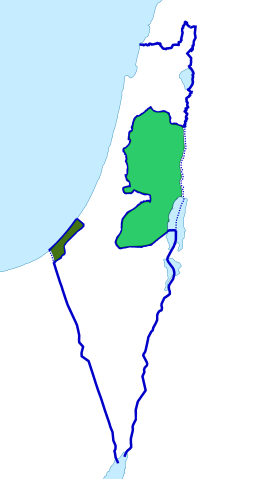 The scheme uses the code "PAL" to refer to the region of Palestine – a Level 3 area. The WGSRPD's Palestine is further divided into Israel (PAL-IS), including the Palestinian territories, and Jordan (PAL-JO), so is larger than some other definitions of "Palestine". This page is based on the Wikipedia article Palestine (region); it is used under the Creative Commons Attribution-ShareAlike 3.0 Unported License (CC-BY-SA). You may redistribute it, verbatim or modified, providing that you comply with the terms of the CC-BY-SA.